The Mediterranean diet generally is not based on rare or exotic foods, nor is it about complex recipes. Most ingredients are easy to find. The original version, particularly the Greek diet which was the prototype of this now popular eating pattern, is based on simplicity. This is a plant based diet with the key components being vegetables and olive oil. 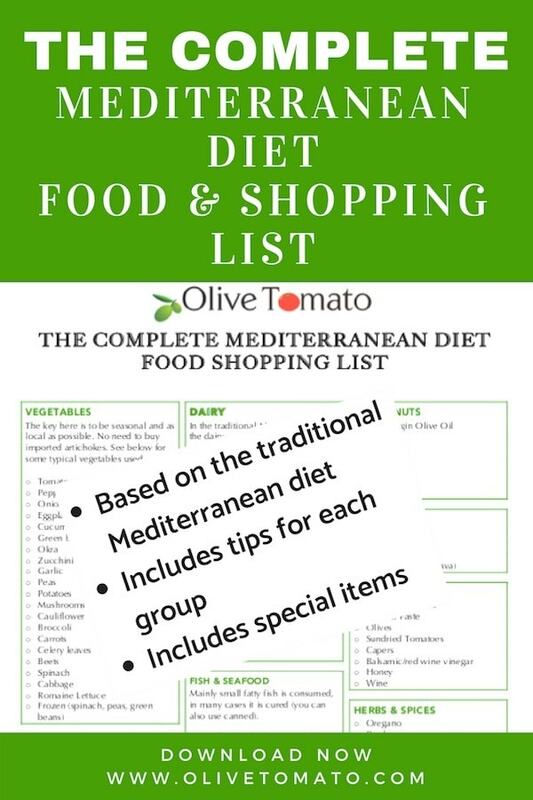 Many of you have requested this Mediterranean Diet food list and here is a free downloadable list (pdf – -CLICK HERE AND DOWNLOAD YOUR OWN COMPLETE MEDITERRANEAN DIET FOOD LIST – ) with all the foods that can help you follow an authentic Mediterranean diet. The list is based on a traditional Greek Mediterranean diet mostly. Some unique aspects include the consumption of greens (horta), mainly small fish, and of course the importance of herbs not only for cooking, but for drinking. Herbal drinks are consumed very often and there has been ongoing research on the benefits of drinking these beverages. 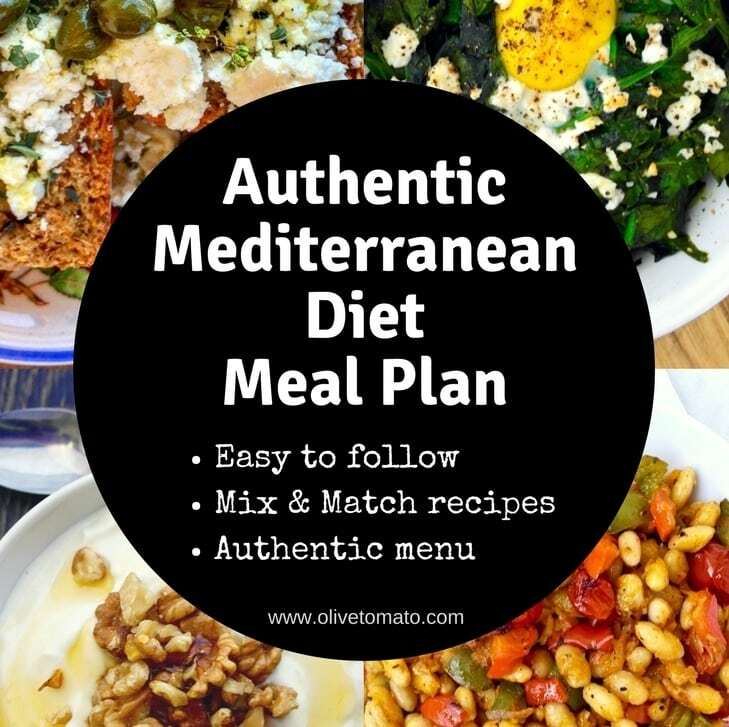 It is important to note that a Mediterranean diet is also a sustainable diet, that means low on meat and going local and seasonal as much as possible. 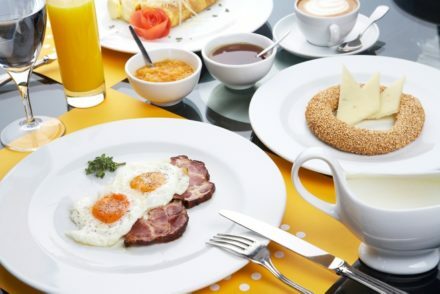 I am quite surprised when I see so-called Mediterranean recipes and almost all of them are composed of some sort of meat with vegetables on the side. That is not a typical Mediterranean meal, a typical Mediterranean meal is mainly vegetables and in most cases no meat, except for celebratory meals. Low on meat means good for the earth. Another important aspect is the local and seasonal aspect. Try and consume vegetables, fruit and fish that are produced or grown as close to you as possible. The key here is to be seasonal and as local as possible. No need to buy imported artichokes for example. What is more important is the method they are cooked and how they are consumed: cooked in olive oil and tomato usually, and consumed as a main course. I do recommend having on hand some frozen vegetables such as peas, spinach (for a quick spanakopita) and green beans when you cannot access fresh produce. Same concept, local and seasonal. 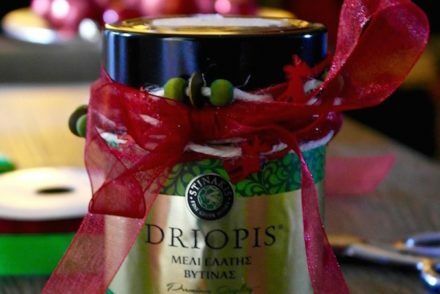 It should be noted that Greeks consume more citrus in the winter which are an important source of antioxidants. Main sources of dairy is cheese and yogurt. I did not include milk in this list, but if you consume it add it to your list. It should be noted that dairy consumed within a Mediterranean diet is not low fat. Red meat is generally consumed once a week and chicken once a week. Meat is not the main attraction in any meal, unless it is a holiday or celebration. Common meat dishes include beef patties with herbs, chicken cooked in tomato, roasted chicken or roasted lamb. The fish is mainly small and fatty. But remember even in Greece in the mountainous areas, fish was not necessarily consumed fresh, but mostly in a cured form. So you can go ahead and use canned sardines and anchovies. The Greek-Mediterranean diet is not a high carbohydrate diet, in fact nutrition analysis show that only 40% of calories come from carbs. They most common carb is bread. Bread accompanies all the vegetable dishes. Once a week there will be a dish with pasta, and rice is often mixed with vegetables such as in spinach rice or leek rice. As noted olive oil is your main source of fat, you use it for cooking, baking and sautéing. 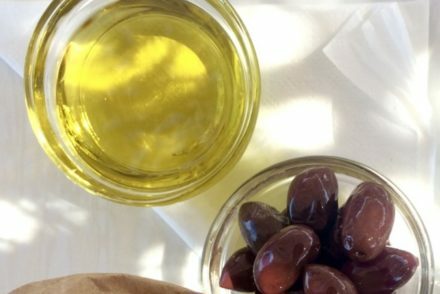 Try and find the freshest extra virgin olive oil you can get your hands on. Get some tips here for buying olive oil. Beans play an important role in the Mediterranean diet. We eat them about twice a week. In Greece we use mostly dry, but canned can work for convenience. Items that are not on the other list will go here. One of my most used pantry items are canned tomatoes that I use when making all those vegetable dishes on the winter. Greek cuisine is mostly a cuisine of herbs, and there a few spices that are used such as cinnamon sticks, all spice and occasionally cumin. Herbs are also used in beverages, and play an important in the health benefits of the diet. This is another aspect of the diet that is important nutritionally. Try and include various greens in your diet. In Greece we lightly boil them and serve them with olive oil and lemon. Or you can make a pita (hortopita) with them. Welcome! 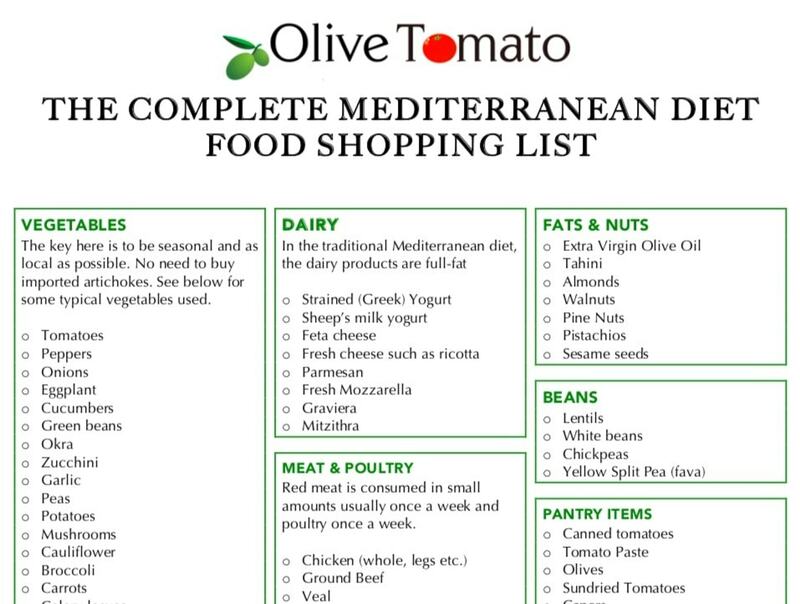 You have arrived to the most credible source for the Real Mediterranean Diet. If you are looking for tried and trusted information, you’re at the right place. Learn more about OliveTomato browse all our recipes or check our lifestyle and nutrition tips. I truly enjoy this website. 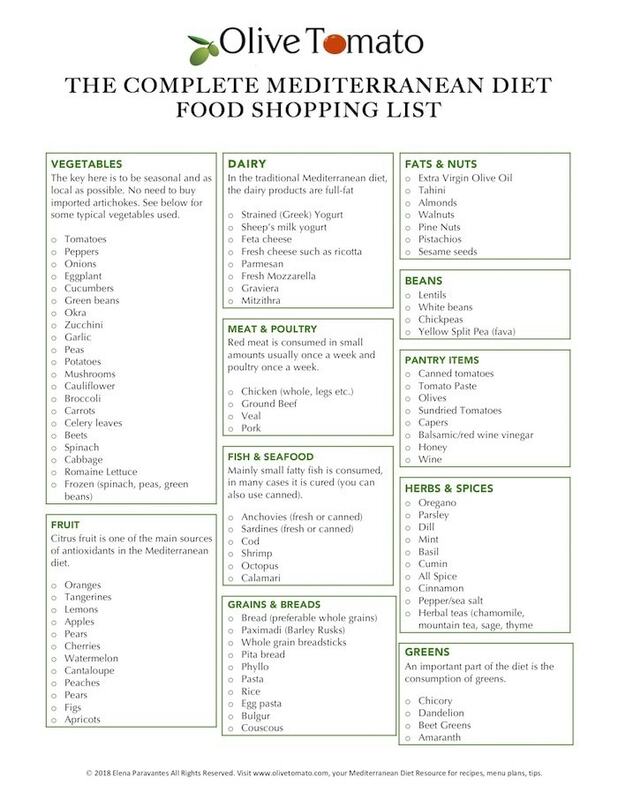 The shopping list is something I take with me on my trips to Whole foods and Kroger. This is the only true Greek Mediterranean lifestyle website. Thank you! Hi Joanne, No the Mediterranean diet is not the same as keto. The difference is that the Mediterranean Diet has hundreds of studies supporting it, while the keto diet only has a few studies and it is not clear if it is safe long term. Also the main difference in terms of food is that the Mediterranean diet allows all food groups as opposed to the keto diet that restricts carbohydrates. It is also high in saturated fat (bad fat) and can lead to nutrient deficiencies among other side effects.